On 3 July 1954, Britain celebrated a different D-Day - "Derationing day" saw housewives gather in Trafalgar Square and ration books burnt around the country to mark the end of food restrictions after World War II. Introduced in 1940 to ensure there were enough supplies to go around, rationing entitled everybody to limited quantities of essential foods and drinks, from butter and cheese to tea and sweets. Nine years after the war ended, meat and bacon were the last items to become freely available again - to the nation's relief. Diets have since undergone a revolution powered by fridges, freezers, microwaves, supermarkets, additives and preservatives, spread by global migration and trade. And yet we are told that wartime diets were some of the healthiest in our history. 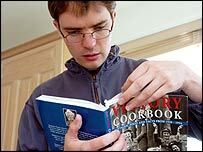 As a child of this revolution, I took my kitchen back in time for one week to get an insight into the World War II eating habits. Ready meals, frozen vegetables, oven chips, convenience foods, exotic salads, soft drinks, orange juice and chocolate are the main items of my modern menu. All would have been unavailable or very scarce during the war. My strict wartime diet was restricted to in-season English vegetables, fruit and bread - which was only rationed after the war - and as a vegetarian, I would have been allowed extra cheese. Then there was flour, oats, a few eggs - but mostly dried egg - and not much else. 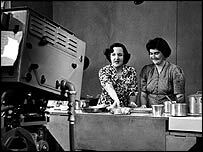 I did not have the queues and unreliable supplies, but I did have the cookbooks by Marguerite Patten, the Delia Smith of World War II and author of classics such as We'll Eat Again and The Spam Cookbook. "It was hard work because we had to make relatively dull food interesting," she said. "But the majority of people thought they just had to do this in order to help the war effort." Giving me advice before my culinary challenge, she said: "I'm afraid if you're going to put yourself on a wartime diet, you must exclude all these interesting things you buy and you must spend a bit of time." Marguerite told me to eat porridge for breakfast so, after a short lesson from my girlfriend, I do. The Diet Cokes that normally kick-start my day are out and it is water all the way. I discover a farmer's market down the road, with fresh vegetables, and I buy what I think is enough to last a long, lean week. I am convinced my hangover is being compounded by caffeine cold turkey. I tell myself this week will also be a detox. Lunch is a cheese ploughman's and dinner is a potato carrot pancake - mashed potato mixed with cooked diced carrot then fried. Unfortunately I also go to dinner with friends, where I resist the Mediterranean menu - until the home-made cheesecake sounds too English and traditional to turn down. It is a bit too nice to be authentic, and I know I must summon all my will power for the rest of the week. Porridge again, then cheese sandwiches for lunch. A trip to the Imperial War Museum does not glean much new information, except that people were permitted one tiny chocolate bar every two weeks. I could normally eat one every two hours. For dinner, I make oatmeal cheese rarebit - a flour paste mixed with cheese and toasted oats. On toast. It looks worryingly like this morning's porridge, and tastes of cheesy glue. I wonder how we won a war on this stuff. I am bored with oats, so have toast and jam for breakfast. I am now bored with toast. I have a day off work so spend the day slaving over the stove - first making vegetable pasties to take into the office later this week. 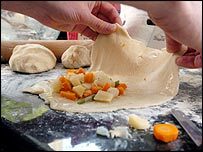 The pastry is a fantastic mixture of mashed potato and flour, filled with cooked parsnips, leeks, carrots and beans. So impressive is the fact that I actually make real pasties that, when I have one for lunch, I forgive the fact that it tastes rather bland. Marguerite's book also has a recipe for chocolate cake using grated raw potato and dried egg so, as it was my girlfriend's birthday, I give it a go. This is my first experience of the pungent powdered egg. It seems to work. Unfortunately I grate some of the potato too coarsely and the cake comes out with lots of crunchy strands. I decide to hide the fact that it was intended as a birthday treat. A summer vegetable pie is for dinner, but I do not realise until it is too late that it involves cooked vegetables covered in cheesy glue. My evening dinners are not going too well, and I long for something with a bit more taste. Back to work after a bowl of porridge and, to my surprise, I do not crave my usual 9am wake-up Diet Coke. I fear that a long day at work will make me miss caffeine, sugar and comfort food more than ever, and a colleague has brought chocolates back from a holiday in Ireland. I succumb, telling myself we would have imported stuff from Ireland in wartime. V bad. One of yesterday's cold pasties is lunch and a friend comes to stay the night. I cook Potato Jane, a relievingly tasty bake of potato, leek, cheese and breadcrumbs. I was going to keep my bottle of English plum wine - with Winston Churchill's face on it - until Friday, but crack it open now as we have a guest. Not bad for emergencies and, when that bottle is dry, I manage to resist the tantalising Italian Pinot Grigio in the fridge. The rest of this week promises to be stressful at work, and I start it with jam on toast. By 10am, my brain is yearning for a caffeine boost and my stomach calls out for satisfaction. When a colleague goes on a tea run, it takes all my will power not to ask him for a nice chocolate croissant. I ride the storm and make it to my next veggie pasty. By the time I finish at 6:30pm, I am starving and long to put some garlic bread in the oven. I have some plain bread instead, and consider making Marrow Surprise - until I realise the surprise is that it is marrow covered in cheesy glue. Instead, I make home-made chips, which were so easy - chopped potatoes in the oven for 45 minutes and it almost tastes like real food. I also make an omelette with dried egg. The smell of the lumpy, reconstituted mixture makes me want to retch and it does not solidify properly in the pan, but - to my amazement, it does not taste too disgusting. Until the powdery aftertaste kicks in. Back to porridge after yesterday's hunger and I make it through the day with only a small cheese sandwich. We have two friends round for dinner. Pizzas - which are forbidden for me - are put in the oven. Their smell wafts, taunting me, and to add to the torture, they are accompanied by French bread, brie and a lush salad. I make do with a cheese pancake, potatoes and two pints of London Ale to drown my sorrows. All hail porridge. It keeps me going again, with another cheese sandwich for lunch. I no longer crave the cookies and chocolate bars I would normally munch. I think my stomach is shrinking. This is no bad thing. Tomato Charlotte - a bake involving sliced tomatoes sprinkled with sugar and breadcrumbs - is accompanied by potatoes for dinner. And my girlfriend's speciality - apple crumble with custard - is a treat on my final night. I have survived. What's more, I have lost a few pounds in weight and saved a few pounds in money on ready meals and canteen lunches I have not bought. I may have missed caffeine and quick, flavour-enhanced dinners - but I have begun to feel less tired and less hungry, and my belly has retreated a little. I resolve to keep on the porridge, and add the successful dishes to my culinary repertoire. I have not gained more than a small insight into wartime life, and readers of a certain age will doubtless be able to tell me I have been doing it all wrong - especially since in spite of trying I may have used slightly more than the quantities I would have been allowed. But my one tiny taste certainly made me wonder what it would have been like if, instead of being done through choice, my menu had been a fact of life. Because of the war I lived with my grandmother from 1941 to 1944. I was aged between 4 and 7 and I distinctly remember bread and dripping , steaming bowls of oxo and bread, fantastic stews with sheep heads with the teeth staring out from the stew mixed with all potatoes and and carrots and dumplings . Possibly the bread and dripping would'nt go down well with health advice today , however there was nothing wrong in those extreme times and my grandmother did a wonderful job of looking after both me and my cousin.She also used to send home grown apples and home made cakes to my father and her various sons also away at war. What an interesting article by Ian Youngs. I was born in Nantyglo, S. Wales in 1942, and can remember such things as ration books, etc. We were also healthy and certainly didn't starve. I have a comment to Jan Lever, UK. Why don't you consider marketting a version of your Mum's cookbook. It would be a great tribute to her and yourself, and perhaps might do us all some good. I, for one, would be thrilled to have such information. An interesting experiment. It shows how much extra and unnecessary food we eat. I am quite tempted to try it, strangely. I think the main problem was the vegetarianism. As in the 1900 House tv programme, it is clear that vegetarians were rare until recently. Any wartime vegheads would have been better at cooking meat/fish free food with restricted ingredients than we are today. I think it is very hard to try to recreate the conditions then. Mostly, it wasn't a question of willpower - there was simply no choice. It's also worth bearing in mind that exotic vegetables, pizzas etc for the large part didn't even exist for the general public in the 1940s so the blandness of the food was not really an issue. The food itself was pretty much the same that the majority of people would've been buying at the time. I imagine the main problem was that it was less available and in lower quantities. 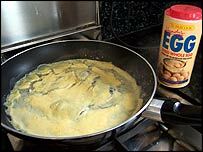 My mum was a young married woman during WWII and told me many times how much she loved eggy bread made with powdered eggs and she also used to make a cheese and egg bake that was also part of my mum and dad's diet until they passed away. She gave me her cookbook, which she had from the beginning of her marriage, and I still use some of the very unusual recipes featured in this book. Fantastic stuff and most interesting - perhaps what is more interesting is that with only a tiny bit more variation in ingredients i.e. a few spices, pulses etc. one would/could have a fantastic diet. Just goes to show how reliant we are on corporate-sponsored salty, sugary, flavour enhanced foods and the consequent effects on our health. Nearly tempts me to going veggie! This does demonstrate what poor value factory prepared food presents. 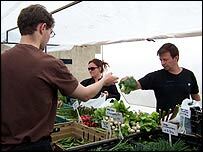 With the ingredients we have available today, a little enjoyable effort in preparation will bring cheaper, tastier and healthier food to the table. I think a major factor in the difficulties faced in this experiment is the fact that of convenience vs planning. There is no way that working full time a diet/lifestyle like this is practical. Also, back then when it was real, people had support from family, friends and the community that just isn't there today. I don't imagine there were many vegetarians around at the time so that made the experiment quite difficult. My mum tells me they used to fill up on broth made with barley or lentils and vegetables, stew and dumplings, spam fritters, corned beef hash, left overs from Sunday roast would be fried up on Monday for "Bubble & Squeak" and bread would be served with most meals to fill you up. Well, that certainly brought back happy memories of my vegetarian childhood! (And there were plenty of us, perforce).Whatever happened to the concentrated orange juice and dried bananas? I refused the real ones after the War because they didn't look or taste right. The diet of British civilians in wartime was dull, frugal but adequate. The economies made on feeding civilians enabled soldiers, sailors and airmen to be better fed and helped win the war. German friends tell me they had it far tougher. Even neutral Sweden had tight rationing. More die now in the affluent West from over-eating and too much of the wrong foods than from starvation. I think Ian would have benefitted from an off-ration lunch in a Works canteen or one of the network of "British Restaurants". Good stuff! A week invested like this can be a valuable lesson in life. Very interesting that you say you feel less tired too. I guess that backs up what my Granny always said, that "breakfast is the most important meal of the day". Skip it, and you're sliding down the slippery slope of sugar-snacking. 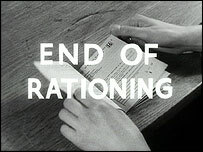 The amazing thing is rationing in Germany finished in 1949 although the country was completely on its knees, yet it continued for another five years in Britain which had neither been occupied nor largely destroyed by bombing. Why?